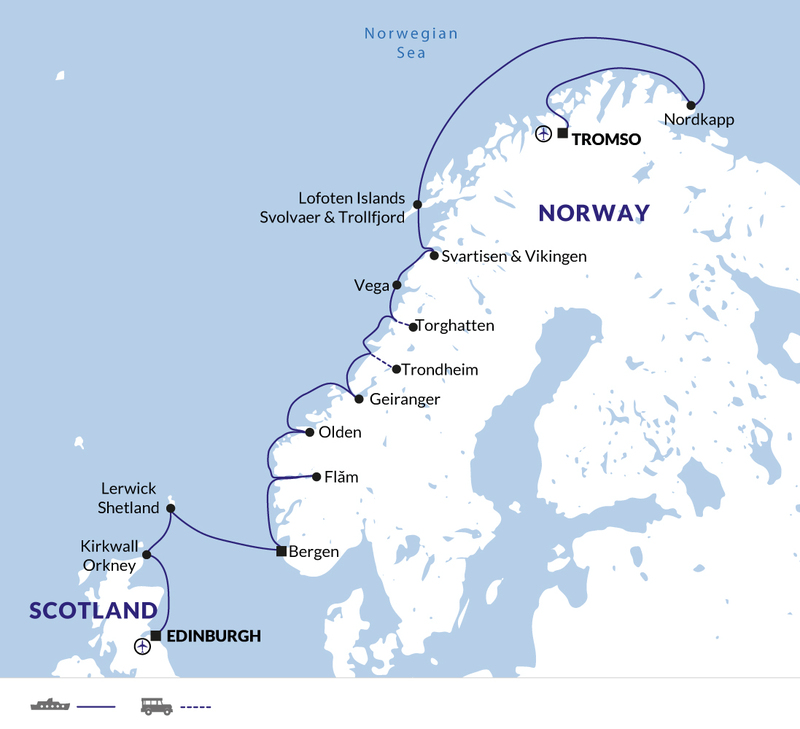 From Tromso we set sail along the norwegian coastline, making our way South to Britain's northern most archipelagos of Orkney and Shetland, before docking into the Port of Leith. Go deeper into the otherworldly fjords of Norway on this unique journey through the Norwegian Sea. Discover UNESCO-protected wonders like the Standing Stones of Stennes, the mystical Ring of Brodgar and archaeological sites, witness the curious clash of cultures in the Shetland Islands and marvel at the stunning forests and waterfalls that line the fjords. Our expedition begins in the outskirts of Scotland's Royal capital. Since the 11th century, Edinburgh, has been home to an extraordinary range of architectural contrast. From dark, medieval 16th century block towers, to classical Georgian and Victorian masterpieces. Listed as a World Heritage Site, Edinburgh is home to over 16,000 listed buildings. We board our expedition ship in the afternoon in the suburb port of Leith. The Expedition departs in the late afternoon, sailing towards Kirkwall. There are few places in the world that offer as much variety as the Orkneys. Only 10km off the coast of Scotland the islands are famous for their abundant marine bird life and dramatic coastal scenery. Our excursions for today will focus not only on this, but also on the many mystical and historical sites of the area. These excursions will include coach visits to the Ring of Brodgar, the Standing Stones of Stennes and the 4500 year old village of Skara Brae. We continue northwards to the remote Shetland Islands. The islands were under Norse rule until 1469, when they were given to Scotland as part of a Danish princess's dowry. The Shetlands are an engaging mix of Scotland and Scandinavia, with spectacular coastlines, varied and abundant bird life and a number of archaeological sites that date back thousands of years. Today we'll enjoy a city tour of Bergen, including a stop at the museum of Edvard Grieg. The museum was built as a legacy to the famous Norwegian composer and pianist who was born in the city. We will follow on with a visit to the historical seaport district, which dates from the Hanseatic League. There will also be time to explore the city on your own and take in the local fish market, which is well worth a visit. In the morning, we cruise from Bergen to Flam. Hop on the Flåm Railway, travelling through valleys and mountain passes to reach the scenic fjord of the Flåm district. Weather and time permitting, we hope to make a stop in Olden and take a short bus ride to the Briksdal area, where we can take a brief walk up to the glacier. A steep climb but it is worth the trek ! We sail deep into one of Norway's most beautiful and frequently visited fjords. The Geraingerfjord was listed as a UNESCO World Heritage site in 2005. It is a 15km branch of the Sunnylvsford and it's tiny village of Gerainger, sits at the very tip. We will have plenty of time to explore the beautiful surroundings and waterfalls found within this magnificent fjord. Today, we will continue on to Trondheim.You will have the choice of either taking an afternoon hike to the Sverresborg Folk Museum, or you can enjoy a city tour which will include the Folk Museum and the elaborate Nidaros Cathedral, built between 1070 and 1300. The rugged coastline of central Norway features some of the world's most beautiful scenery. The captain will liaise with local Norwegian pilots to determine our best Zodiac landing options. At Torghatten, you can hike up the famous landmark, the mountain with a hole right through it. It is an easy walk and offers rewarding, panoramic views from the top. In the afternoon, we head to the quaint and picturesque Vega Island, another listed UNESCO site. You will have time to wander through the fishing villages and appreciate the slow pace of life found here. Today we visit Svartisen and Vikingen. Svartisen is Norway's second largest glacier, and is the lowest accessible glacier in mainland Europe, at only 20m above sea level. We will visit Vikingen, a point directly on the Arctic Circle, which is marked with a Globe-shaped monument. The Lofoten archipelago is an enchanting area of picturesque villages, backed with jagged peaks and perched by the sea. Go ashore via coach on the island of Å, where cod fishing is still a major part of the economy. In the evening, stay on deck as you cruise into one of Norway's most famous fjords, the short yet dramatic Trollfjord. Search the cliffs on your continuing quest to spot trolls, the mythical creatures of Norwegian legend. Enjoy a day off the coast with Zodiac excursions to search out the local marine life such as orcas and other whale species. Head back to the coast and visit Nordkapp in the Finnmark region. Take a scenic drive of this high rugged coastal plateau. This will be the most northerly point of the trip at 71 ° N.
We arrive in Tromso, the capital of northern Norway, known as the Gateway to the Arctic as it was the embarkation point for many Arctic expeditions. We will disembark in the morning, after breakfast. We recommend booking some extra time in Tromso to explore the city further. The Arctic Cathedral is probably the most famous landmark of the city, but you can also enjoy wandering amongst the traditional wooden houses that are found here, some of which date back to the 1780's. The city is a cultural centre of the region, with many festivals taking place over the summer months. These will be provided by the ship operator. Please register your size with us before travel and we will arrange for your parka to be available in your cabin on arrival. You usually have to step from the Zodiac into icy water up to 30 cm high on most landings. Do not bring heavy, cumbersome boots that make it difficult to walk or boots with metal cleats as they cannot be used for landings. For maximum warmth, wear loose-fitting boots and two pairs of socks. Try out your boots before the voyage. At a nimble 105 metres (345 ft) in length, with a capacity to hold 132 guests, the Expedition is an ideal vessel to ply polar waters. The ship is large enough to provide stability, speed, spacious cabins and ample public space. Yet she is small enough to manoeuvre in remote areas and get you close to the action. Ship stabilizers ensure a smoother ride in rough waters, such as the infamous Drake Passage enroute to the Antarctic, allowing you to enjoy more of your time at sea. A fleet of ten zodiacs allows passengers to get out and actively explore the remote shores of our destinations. The Expedition is a speedy vessel. A top speed of 16 knots means you'll spend less time getting from A to B, and more time to explore your surroundings. For Norway and Scotland entry visas are not required for UK, AUS, NZ, CAN, USA citizens. Other nationalities should consult the relevant consulate. 15:00 at Apex Waterloo Place Hotel before 15.00 for luggage transfer - passengers will transfer at 16.00. Information After disembarkation, you will be transferred to either the airport or the Clarion Hotel the Edge, depending on the time of your flight. Those transferred to the hotel, will have an opportunity to explore the town centre on their own, and then be transferred to the airport later in the day as per flight schedules. Transfer times will be confirmed, and communicated onboard prior to departure. Luggage storage at the Clarion Hotel the Edge will be available until time of departure. 11:00 at Apex Waterloo Place Hotel before 15.00 for luggage transfer - passengers will transfer at 16.00. 13:00 at Clarion Hotel the Edge before 13.00 for luggage transfer - passengers will transfer at 16.00. Information After disembarkation you will be transferred to either the airport or the end hotel stated on your tour voucher, depending on the time of your flight. Those transferred to the hotel will have an opportunity to explore the town centre on their own, and then be transferred to the airport later in the day as per flight schedules. Transfer times will be confirmed, and communicated onboard prior to departure. Luggage storage at the end hotel will be available until time of departure.